THE BRITISH RAILWAY STORIES LTD: "Mis-identity change! A4 Pacifics"
It's been a while between blog entries this month, mostly because I've spent an inordinate amount of time sleeping when at home. The traveling is finally starting to get to me! But I cannot complain because I like my job and it pays well for the time I put in. However with the tiredness, comes mistakes, and for anyone who has a copy of RCTS volume 2A, you'll spot the mistake which creeped into my modelling this month in about three paragraphs time. One of the things I have wanted for a while now was an A4 Pacific in the BR experimental purple livery. But not just any A4 - it had to be a purple A4. 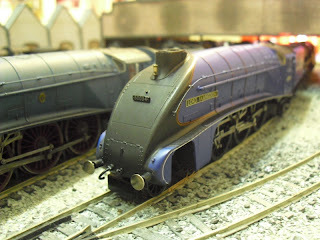 I found, many moons ago, a photograph by a T. Revelly at a model fair of one such engine sitting at Leeds Central in this livery, with the Yorkshire Pullman behind. I was therefore delighted when a recent eBay bid came up trumps and a second hand and clearly quite battered 60027 Merlin came into my hands. I say battered, and I mean battered! I really do mean battered, by the way. The plastic cartazzi was split and needed replacing. The motor needed to be re-soldering to the connector for the tender plug. There was a chip on the tender's top side sheet, on the driver's side which I carefully stuck back and then went over with a wet'n'dry foam pad and water to hide the crack. The valve gear was split on one side and I took the opportunity to replace it entirely. 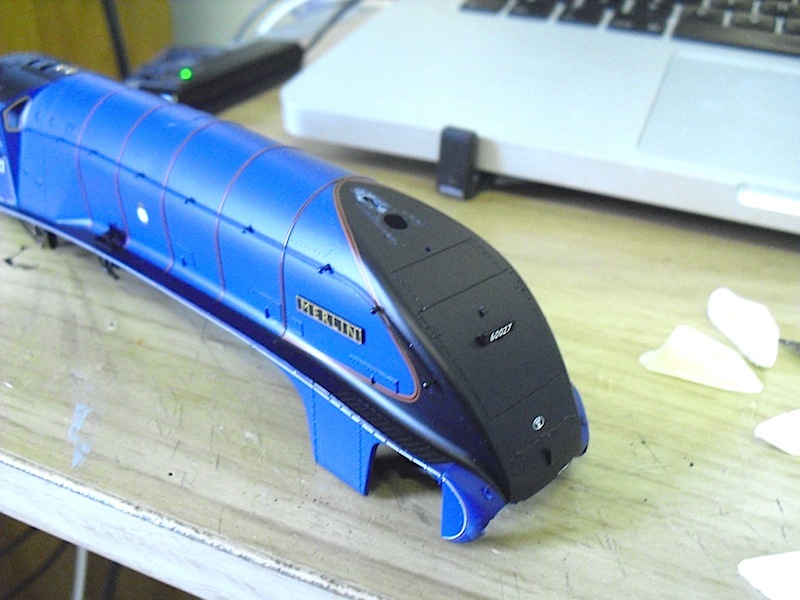 The reverser was missing entirely, and like my de-frocked Mallard, Lord Faringdon is still missing this until I can source replacements. 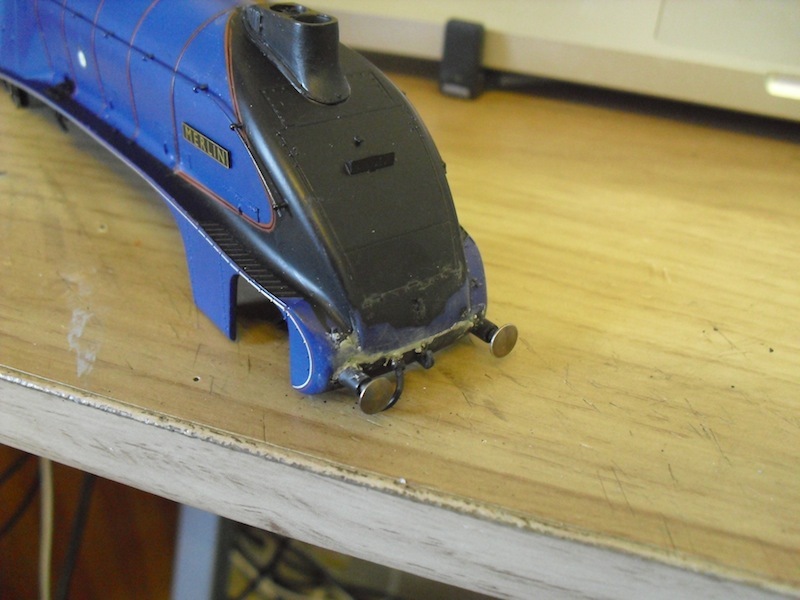 The worst part came with the realization that the previous owner/s had clearly ripped off the original bufferbeam at some point, and replaced it with an older Margate version of the A4 bufferbeam, clearly cut from a spare bodyshell. On removing it, a whole load of material came away, and the clear extent of the damage to the front end of the model was shown. 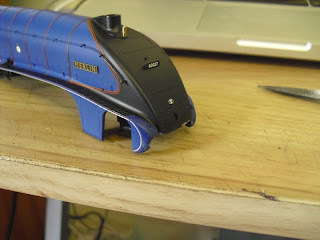 So I rummaged around in my spares box and came up trumps with a spare bufferbeam from a Railroad Mallard model. This also provided a spare, more realistic looking chime whistle (possibly of Bachmann A4 origin), and some Humbrol model filler. One of the things I would also need to change on 60027 would be the chimney. I knew from my research (!) that Lord Faringdon was a double chimney A4 for her entire life, and luckily I could call upon one of the excellent Graeme King resin double chimneys to fit, after carefully removing the original single chimney (which may be used for another A4 Pacific project later on). So I fitted the new bufferbeam using a few drops of loctite, on the bufferbeam tabs, to hold it into position. The next stage was adding Humbrol plastic model filler and filling down the bufferbeam section until the seam was removed. This seam aggravates me on the Hornby A4s, and the purpose of this particular project to some extent was to see if this seam could be reasonably removed and the rivets reinstated on the front end to a good standard. The resin rivets were sealed with a coat of Gamesworkshops Chaos Black acrylic paint before I started the identity change. The Merlin nameplates were removed carefully with a scalpel, the area for the nameplate being carefully and lightly sanded with a wet'n'dry foam pad from B&Q, and the Fox Transfers nameplates stuck into place. The idea was to replicate the Hornby rivets whilst also removing that seam, and to some degree I think it's been a success. It looks a bit better minus the seam, but I clearly need more practice with applying the rivets to the model. Note the curly 6 numeral on the Fox Transfers smokebox numberplate, correct for this period (1949). Yes, I managed to get "GB" (garter blue) and "EP" (Experimental Purple) the wrong way round. I therefore should have been modelling Walter K Wigham. There is some relief as that nameplate is as long as Lord Faringdon's. Less relief when I realize I have to revert the model back to being a single chimney A4 and it needs the 34 changed to a 28. However there is a further point which may have forced the error further. 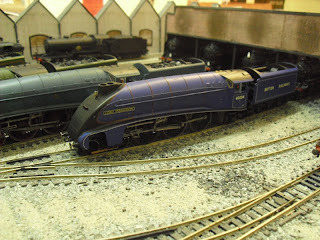 If you have a copy of Railway Modeller, February 2012, and you turn to page 138, you will see a familiar looking purple A4 Pacific, on Mr Eric Walford's excellent Boreham MPD layout. It seems this mistake is more common than I thought! With apologies to Mr Walford, whose modelling is excellent, but whose A4 is sadly identical to mine in that it's wrong. So, what to do? Well, I will be finding out if there is a supplier of single chimneys to replace the double chimney I have fitted, and I will be changing the model posthaste over the next few weeks to Walter K. Whigham. Ah well, I only have to do it once more now! I thought I'd end on a high after the severe low of realizing the mistake, so here is the purple A4 sitting with Mallard, Sir Ralph Wedgwood, and the lone W1 in a lineup which would never have happened either!